Jeffrey P. Tomkins, Ph.D. and Timothy L. Clarey, Ph.D.
Red algae form one of the main components of coral reefs and were originally thought to have appeared on Earth during the middle of the Cretaceous system about 100 million years ago. At least that’s what the standard evolutionary story claimed until the same type of fossils were just discovered in Silurian system rocks they dated at about 430 million years.1 This is a whopping readjustment of the ever-flexible evolutionary story by over 300 million years. For a secular paleontologist, this would be roughly equivalent to finding a Jurassic dinosaur fossil in the Cambrian. The Great Barrier Reef off the east coast of Australia, and nearly every other large reef across the world, owe their massive bulk of biomass in large part to a type of red algae that grows on and strengthens the corals. 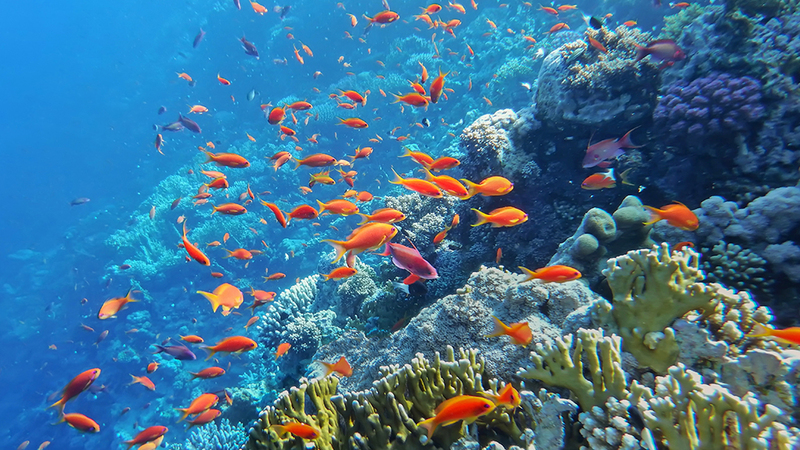 The algae stimulate and enhance reef growth by attracting coral larvae to the growing reef—serving as a source of food for these and other reef animals. The algae also help patch up the coral in the reef by growing over breaks. The calcareous skeletons of the red algae ensure that coral reefs remain strong so that they can withstand heavy storms. According to the evolutionary model, red algae did not evolve until the Cretaceous system, the youngest system during the alleged time of the dinosaurs. Now the same type of coralline red algae fossils, just like ones living in reefs today, have been found in Silurian rocks claimed to be about 430 million years old.1 Of course, just like the ones first discovered in Cretaceous rock, they appear suddenly in the fossil record showing no signs of having evolved from any precursor, and they look just like modern red algae. Not only does this new out-of-place fossil wreak havoc with evolutionary timelines used to calibrate mythical evolutionary clocks, but there’s no explanation as to what happened to the red algae for 300 million years. They seem to disappear in the rock record and then just as suddenly reappear in much younger rocks. This phenomenon, known as the “Lazarus Effect,” has been noted before with other fossils, like the sauropod dinosaurs who disappear in the Lower Cretaceous and then reappear in the Upper Cretaceous, some 30 million years later, according to the evolutionary timeframe.3 But the red algae makes a resurrection jump of ten times that amount to 300 million years! All of this evolutionary confusion, reevaluation, and speculation could be immediately alleviated if paleontologists used the Bible as their source of historical information. In the book of Genesis, we have the distinct record of a violent global flood that destroyed life on Earth and buried the evidence in sedimentary rocks in a short amount of time. When viewed in this light, the geological column and its accompanying fossils represent the progressive extinctions and rapid ebb and flow of water burying entire ecosystems over the course of the flood year.4 Therefore, the sudden appearance and unchanging nature (stasis) of fossils along with the supposed huge gaps of millions of years, become non-issues. The fossils are merely a consequence of the order of burial as tsunami-like waves progressively transported sediments filled with the remains of animals and plants onto the continents, wave after wave. All of this evolutionary confusion, reevaluation, and speculation could be immediately alleviated if paleontologists used the Bible as their source of historical information. When this Biblical flood model is applied to interpreting the presence of red algae in rock layers, the discrepancies in strata layers and first appearances become trivial. The mixing of marine creatures in different strata is not a time issue of millions of years, but rather a regional geographical issue in the burying of global ecosystems during the course of the flood year. 2. Friedrich-Alexander-Universität Press Release. 2019. FAU palaeontologists demonstrate that coralline red algae have existed for 300 million years longer than previously presumed. Posted on fau.eu on January 16, 2019, accessed January 18, 2019. 3. Clarey, T. 2015. Dinosaurs: Marvels of God’s Design. Green Forest, AR: Master Books, 164. 4. Clarey, T. L. and D. J. Werner. 2018. Global stratigraphy and the fossil record validate a Flood origin for the geologic column. In Proceedings of the Eighth International Conference on Creationism, ed. J. H. Whitmore. Pittsburgh, Pennsylvania: Creation Science Fellowship, 327-350. Dr. Tomkins is Director of Life Sciences at the Institute for Creation Research and earned his Ph.D. in genetics from Clemson University. Dr. Clarey is Research Associate at ICR and earned a doctorate in geology from Western Michigan University.